A few posts back I mentioned a poem that Rebecca had written for her mother for Mother's Day. 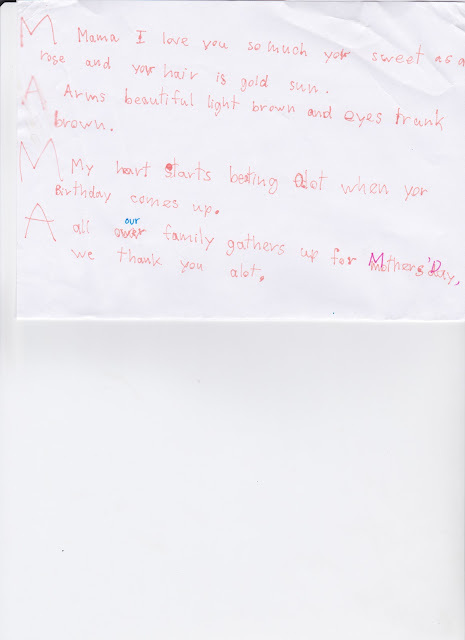 What I did not mention was how moved I was by the words that she wrote (completely on her own--she's seven years old, btw) and how frustrated I was with myself for having misplaced the rough draft. She gave the published copy to her mom as a Mother's Day gift along with a plaque. While cleaning out my craft basket yesterday, I was delighted when I ran across the first copy of Rebecca's poem. I double dare you to read it without sighing dreamily at the end and saying, "Awwwwwwwww!" to yourself or out loud. What's that? You have something in your eye? Here, have a tissue. I needed one, too.